The craft of turning olives into oil has been honed in Palestine over thousands of years, and techniques have been passed down from generation to generation. Olive Oil extraction is the process of separating the oil from the fruit’s pit and pulp. Palestine is considered the native home of the olive tree. Traces of the olive tree in Palestine date back six thousand years. There are mechanical presses found that date back to 1,000 BC and stone presses found in olive orchards believed to be from the Stone Age. In ancient times olive oil was produced by placing olives on a large granite base, with a huge, cone-shaped stone on top. The stone would be turned, and the friction, along with the weight of the stone, would squeeze and rip the olives, producing olive oil. Today the process is much the same, though hydraulic presses are used instead of human or animal power, and metal has replaced granite and stone. Pressing is the key activity in determining the quality of olive oil. The olives must be pressed as quickly as possible, and while waiting to be pressed they must be properly stored. During the actual pressing the water must be changed frequently and once pressed the oil must be stored in containers to control the level of acidity and dioxide. Many olives must be pressed to produce a small yield of olive oil and the production requires time. It is important for the temperature during pressing to be below 27 degrees Celsius, so that the fruit juice is not degraded. Although heating the fruit will produce a higher yield of olive oil, true extra virgin olive oil can only be produced when the olives are cold pressed to prevent decomposition, the way olives are pressed at our farms. The olives are delivered and stored in the collection plastic boxes in a cool yard. There is a hole in the ground made by stainless steal to collect the delivered olives. The olives are transported to the stainless steal hole and from there by a belt conveyor to the first processing stage. 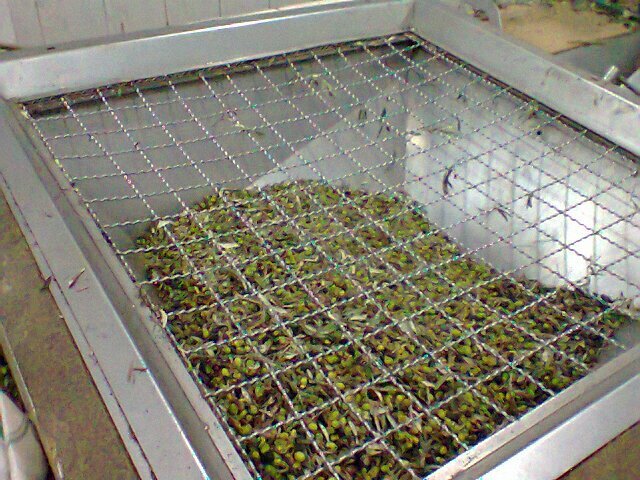 After the olives are filled into a stainless steal hole in the ground, they transported by a belt conveyor into a sucking device, where leaves, wood particles and other disturbing solids are removed. After removing the leaves and branches, olives transport by the belt conveyor to a stainless steel tank for washing by fresh water to reduce the presence of contaminants, especially soil which can create a particular flavour defect called “soil taste”. When olives arrives the washing Tank, water exit from the small pores at the bottom of the washing tank in a shape of bubbles to wash the olives for few seconds and to push the clean olives to the stainless steel collecting tank. Through a small opening pores, the washing olives transport from washing tank to the collecting tank, then by the belt conveyor, olives transport to the grinding device. The olives are then taken to the ‘crusher’. The olives are ground up, together with their stones, and mixed into a homogeneous paste. After grinding, the paste is stirred slowly for another 20 to 30 minutes in a particular container (malaxation), where the microscopic oil drops unite into bigger drops while the crushed bits of pit attach to the fruit, skin and water which facilitate the mechanical extraction. The paste transfers by thick tubes to the closed stainless steal drum for pressing. This drum has two exits, one for oil and one for the others. The paste is pressed by centrifugation which is much faster and more thorough. After pressing, the oil with water and residual elements exit from one side to the centrifuge while all of the other, heavier elements of the paste exit from the other side. Oil separation is done by centrifuge. The centrifuges contain filters and have one exit for the (heavier) watery part and one for the oil. The contents of the mixers is rapidly spun, allowing the lighter olive oil to exit at one end and water with residual solids particles exit the centrifuge at the other end. Olive oil should not contain significant traces of vegetal water as this accelerates the process of organic degeneration by microorganisms.In general; filtering olive oil removes all of the tiny solid particles that may reduce the shelf life of the oil. These small solid particles make the oil cloudy so filtering ensures that a product will have a uniform clarity across all bottling lots. Once the oil is pressed, it transfers immediately for storage in the airtight, cool and dark stainless steel collecting tanks to ensure its freshness and preserve a superior taste, color, and body. The olive oil is ready for packing in tins. And now, we have the season’s new extra virgin olive oil.